I made us some cookies. It started as a quest for a Passover dessert that could be made in advance, if, say, you were the type of person who may or may not have (I admit nothing) invited eight people over for a Passover seder 48 hours after returning from a week-long sojourn on the open sea and wanted to get a head start on cooking. I started with a delightful sounding recipe for almond cookies with jam thumbprints that I am sure someone’s family will enjoy and I do hope someone makes those for them. But I wanted to turn these into something for my family which meant that somewhere, there had to be chocolate. And if there was chocolate, there may as well be hazelnuts. But that wasn’t enough either because man, I hate putting too much energy into a recipe with limited use, you know, a dessert recipe for the subset of people who a) want to eat cookies, b) want to bake the cookies that they’re going to eat, c) also celebrate Passover, when, for eight days, these cookies must be flour-free and d) actually want to eat these cookies during those eight days, so I made them two ways, one that involves matzo cake meal and one that involves flour. You know, for the other 357 days of the year. It took a little tweaking (and a little accepting that different ingredients will indeed work differently; i.e. the cookies with flour spread a little more) but I am pleased to say that anyone who wishes to can enjoy these cookies. They’re crisp on the outside and chewy and dense on the inside; the hazelnut flavor is extremely pronounced and the cookies are clearly delighted — if taste is any indication — to have chocolate bellies. Can you blame them? Bellies are delicious. This week: We’re on a boat! We’re sailing the sea! Thus, comment responses will be slow and spotty. However, new posts will (hopefully) still magically appear as we work through my cooking backlog. Everyone wins! Pulse hazelnuts, sugar, matzo cake meal or flour, and salt in a food processor until finely ground. (Be careful not to grind to a paste.) Transfer to a bowl and stir in butter, egg, and extract until combined well. Chill dough, covered, until firm, about 30 minutes. Drop level tablespoons of dough 1 inch apart onto 2 ungreased baking sheets (though I lined mine with parchment paper, for an easier lazier clean-up). Roll dough into balls, then chill until slightly firm, about 10 minutes. 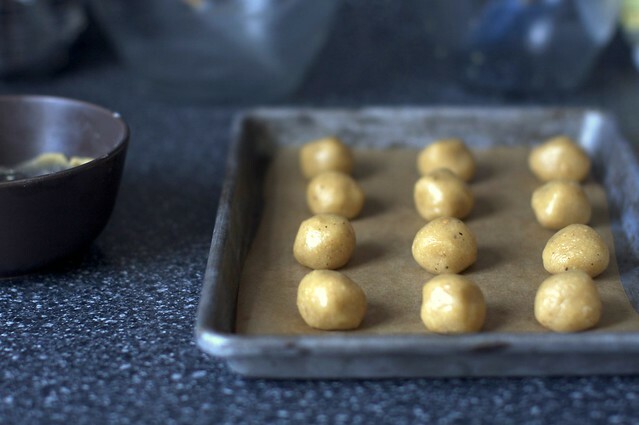 Press one piece of chocolate firmly into the top of each ball of cookie dough and bake, 1 sheet at a time, until tops are pale golden and undersides are golden, 10 to 12 minutes. Be careful not to overbake. Transfer cookies to a rack and cool completely. To fill with jam instead: After balls of cookie dough have been chilled for an additional 10 minutes, make a 1/2-inch-wide (1/3-inch-deep) indentation in center of each ball using your thumb, index finger, or the rounded end of a wooden spoon. Fill each indentation with 1/4 teaspoon jam. Almond variation: The hazelnuts can also be swapped with 3/4 cup sliced almonds. Do ahead: Cookies keep in an airtight container at room temperature 3 days. You had me a chocolate hazelnut. Heck. You had me once I saw “Smitten Kitchen (1)” in my google reader. Hope you are enjoying your vacation! Ferro Roche in cookie form? Count me in! Chocolate and hazelnut is probably my favorite cookie combo of all time – I love it in crinkle cookies. These look wonderful, and hey, way to go on the matzo adaptation! I can’t believe I have the honor and privilege of being the first to comment. These cookies look delightful, completely understand that you can’t have life with out chocolate. I hope you are having a wonderful time sailing the ocean blue. Am making your St. Louis Gooey butter cake today! You’re a genius! These look amazing. Similar to the peanut butter cookies with Hershey’s kisses, but way better. Have a great vacation! This reminds me of those peanut butter cup cookies that I would go crazy over every Christmas when I was a kid. I like more sophisticated grown-up take it, and I might try the jam version because it’s spring! Huuummmm seems so DELICIOUS !! There’s a reason why I’m willing to stick my finger into a container of Nutella at any time of day – that fantastic chocolate and hazelnut combination. These cookies are absolutely adorable and who definitely cure my craving for something sweet. I’ve made the almond meal version of these cookies, and they are AMAZING, so i can only imagine the delightfullness of the hazelnut version. And I’m thinking a nutella filling would really put these over the top! Oh! There’s hazelnuts in the dough! See, I originally thought they were standard thumbprint cookies with Nutella in the middle. This is so much better! Yum! oh good GOd! 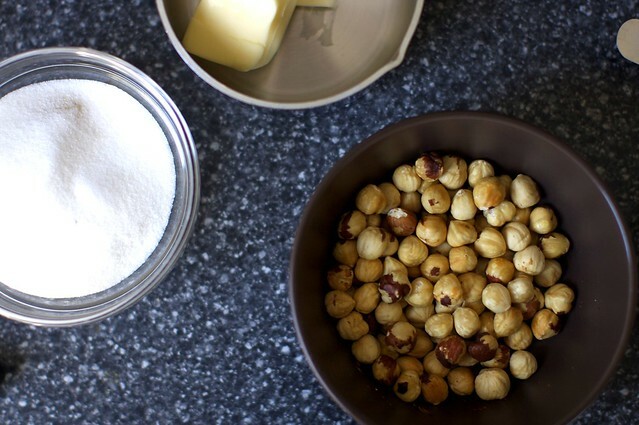 I love hazelnut and I just have to make these. I’m thinking of filling them up with Nutella!! My family will thank you. Question: In the first photo, why do the ones on the right have a cracked surface, and the rest don’t? Is it because they’re different flours? I just purchased some Nutella. I guess I know where it might end up now! These look dangerous! Anything with chocolate and hazelnuts is bound to be amazingly good! Who could pass over hazelnuts and chocolate? I tried Ina Garten’s amazing jam thumbprints with coconut [ http://www.foodnetwork.com/recipes/ina-garten/jam-thumbprint-cookies-recipe/index.html ] and yours are next on the list. I’m in for anything that tastes like Nutella. yum-ola! hope you’re having fun!! Hazelnut and chocolate seem to be a big hit with everyone. These look fabulous! oh, these cookies looks so sweet! How tasty! I’ve been trying to find something to make for a Passover dessert this year – these would be great. Thanks! Oh my – I don’t have to convert to make these right? I think I’ll go get the ingredients asap. Have fun on the high seas. Just curious as to which you preferred, the Passover or the non-Passover version? Lise — Weirdly (because I find matzo meal of any sort to have a strong taste I can’t ignore in baked goods), I liked the Passover version because they were even sturdier. (They’re the taller, more craggy ones in pictures.) But both versions went fast. Purple Foodie — See above. The ones with less spread have matzo meal in them. I cannot get over how amazing your blog is! And the photography is outstanding!!! You make everything look so good!! Mmmm…chocolate and hazelnut. Classic and delicious combo. I just did a post yesterday on hazelnut thumbprints with my own Italian plum lavender jam! 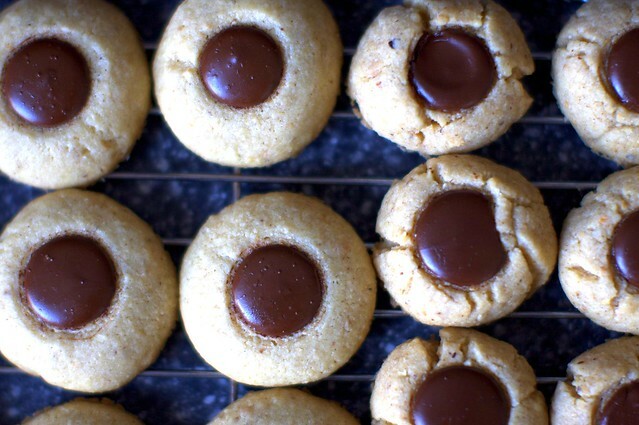 I love hazelnut and chocolate together; thumbprints are so fun to make and to eat. Baby girl would probably like to provide the thumb. The only nut cookies that I have tried are almond cookies and peanut cookies. next on my list would be this one….looks pretty & delicious. i used the original almond recipe 2 years ago for passover, making some with apricot jam and some with chocolate discs like you. i never thought to use hazelnuts! (slapping myself on the forehead) now i know what i’m cooking this weekend. thanks for the idea! Hazelnut and chocolate are one of my favourite combos! I bleed Nutella so this is right up my alley. Yum! They look really good. I love it that you photograph the ugly ones as well as the perfect looking ones. I think it really captures what home baking is like. Looks good! Can’t wait to see boat pics! Looks delicious!! I made sesame thumbprint cookies a few months ago, filled with chestnut cream–thumbprint cookies have a way of making you smile with those cute little bellies! my jaw dropped when your page loaded… and the drool quickly followed! Hey I made these last week too but no filling opted not to.. Hazelnuts do stand out! Love the aroma! Oh, so tasty. I’m a sucker for my new love Nutella and may have to use that instead of chocolate in these. I make a cookie like this for Passover with chopped pecans. Filling them with chocolate is a great idea. Speaking of easy Passover cookies, I just made Alice Medrich’s Beacon Hill cookies–and they are a flourless chocolate cookie that is outstanding. Mmmm what a fabulous new direction for thumbprint cookies, which are some of the best cookie types there are! YUM. Am I the only one thinking ‘browned butter’ here? @Heather – I’m totally with you. If you’re going to melt the butter, you may as well brown it, right? It seems like every comment I ever make at the Smitten Kitchen is about browned butter…Deb, you’ve taught us well! Yum! This look great and easy too! Thank you!! I’m glad you switched to chocolate. I would do the same for my family! I think I have matzoh crumbs, but I imagine that isn’t the same thing at all! Either way, I certainly have flour and I know my husband wants me to make him homemade Nutella-y treats! Oh man, those look good. Whenever a make cookies without chocolate, no matter how decadent and delicious, there is still, inevitably, a look of disappointment on my family’s faces. I think you got me at the thumbprint. I love (again) anything I can smush. And my recent obsession with nutella tells me this is an awesome recipe. Ohh wow these look so so tasty! I havent made cookies for a while, cravingsss! Sound delicious! Have a great trip. YUM! Looking forward to trying these!! I may have to make your version this year as well because I love hazelnuts. Hi Deb! I am a long-time reader, but this is my first time commenting. I just wanted to let you know how much I appreciate the consistency of your posting. I’m sure anyone would have forgiven you for taking a break from blogging while you were in the hospital having a baby, but even then you left recipes and stories for us. This is one of the many many MANY reasons that I adore Smitten Kitchen, but I had to share at least that one with you. Thanks again! Those cookies look delicious…mmm, chocolate and hazelnuts. Hope you’re having a great vacation! How can matzo cake meal made from matzo’s magically become flourless? Unless you make the matzos without flour it makes no sense. Thank heavens we don’t have to go any further for our cute baby fix! He’s adorable. The cookies with the chocolate thumbprint are a much better idea than JAM! Seriously! Thanks! Holy hazelnut goodness, Batman! I’m going home to make these immediately, if not sooner! These look fantastic. 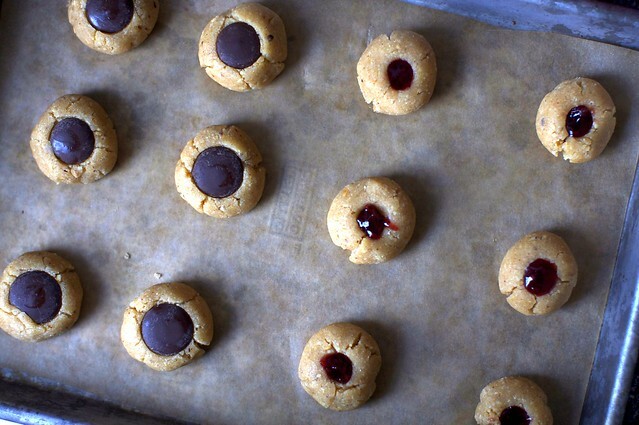 I’m a big fan of Ina Garten’s thumbprint cookies but it had never occurred to me that anything could be better than raspberry jam. Clearly I was mistaken. I think I’ll take a batch of these into my office for those among us who will be celebrating Passover. My parents will be on the open ocean during Passover, so we’re doing it a couple weeks later and calling it Passed Over. Thanks for the recipe, I think everyone will love it! I have left over hazelnuts from my brother’s birthday cake, and I was wondering what to make. Now I know! Thanks, these look awesome. I made your hazelnut truffles for a gift this weekend and have ground hazelnuts leftover. I intended to go looking for something chocolate to use them in and here we have it. Perfect timing! I recently made hazelnut coffee brownies, and I LOVE the chocolate/hazelnut combo. I hadn’t made the Nutella connection – duh! May have to try these cookies.Thanks for another great recipe and mouth-watering photos! YUM. I love how those little jam thumbprints follow afterward. Whenever I make thumbprints, I always am sure to make a few with jam. Uh-oh, checking out your blog at my prime snacking hour might have been a mistake – like grocery shopping on an empty stomach! These cookies look scrumptious – I’d like to try one of each and then eat 20 more. Hmmm…now what can I snack on?! my mom used to make almond thumbprints with raspberry jam all through my childhood, and still on the odd occasion sends me a batch in university. such a treat even good for breakfast! thanks for this! Desserts in my family must involve chocolate too (and in the case there is non-chocolate dessert, it must be accompanied by a chocolate option!) Chag Pesach. oops! pressed post too quickly. Chag Pesach Sameach! these look great with chocolate in the middle! Deb — thank you SO much for this recipe! Actually, you have a ton of recipes which are perfect for Pesach, like the swiss chard-sweet potato gratin– I’ve been going through the archives for ideas because just because it’s Passover doesn’t mean we need to eat poorly. Thank you so much — for this AND the cheesecake which we’re going to be having for sure! This is fabulous, can’t wait to try it! For those considering using Nutella, and who keep Passover, Nutella contains soy-derived lecithin which is considered by some to be kitniyot (essentially grain) and forbidden during Passover. These look great and I am with you and your family on this one – if it’s dessert, it must include chocolate! my grandmother used to make these for christmas! how do you manage to answer to my every need? gooey butter cake to satisfy cravings. passover cookies to satisfy restrictions. man you’re good! Deb, these are great! My Passover baking marathon begins on Sunday, and I’ve been dying for something new this year. My onyl question is, I don’t have a Passover food processor – can I use 4 oz ground hazelnuts or almonds in place of the whole? I haven’t yet started on my Easter cookies. This is a great way to start, I’ve never had these before. Hazelnut and chocolate… delicious! i love thumbprint cookies. i can easily eat a whole dozen to myself. the hazelnut chocolate filling sounds divine! i look forward to trying these out. I would love the hazelnut flavor in these. Yum! Yours look so perfect! I always get mine with the slightly broken edges. MMM I love thumbprint cookies. They always look like jewels! Thank you sooo much! I am totally making these over Passover and shipping them to family. I love that the dessert doesn’t rely too heavily on eggs. I will probably try to substitute the egg with potato starch and leavener. wish me luck! I’d like to know more about the chocolate you used, the discs, and if you ever melt chocolate and temper it — if so, some tips would be welcome. I generally use Ghiradelli chocolate, sometimes Guittard chips. Can’t wait to make these. Love your site. I echo the question of E.T. – what is matzo meal made of? I assume it is ground-up matzo, which in my experience is just about nothing but flour. Does pre-cooked flour magically turn into not flour? Please elucidate. If I make these now, can I freeze them and serve them on Passover? 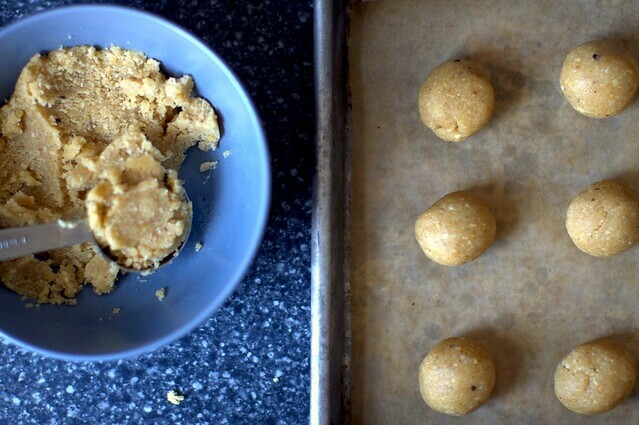 I never froze cookies that had matzah meal in them before…but these look like a worthy recipe to try it on…thanks for coming through for the holiday! Sara — I prefer to freeze cookies before I bake them, so they always taste fresh. Questions about matzo meal versus flour — The main difference is that matzo meal is made from ground matzo and matzo is more or less flour that has already been baked. Flour that has already been baked does not work the same as flour that has not been. In fact, from a baking perspective, it works terribly (the glutens are baked and kind of DOA) which is why special recipes are in order. Susan — You can use already ground nuts. My nieces thing making thumbrint cookies are so fun! They love pushing their fingers into the cookies to make the indents. These look so good…will be trying your recipe soon…! Nancy #94: Click the words “chocolate baking discs” in the recipe; they’re linked to the site where you can read more and purchase them, if you like. Scroll down to “Ingredients and Preparation”. Looks Cute – I mean the Chocolate Belly! Oh, here’s something wonderful: for those of us who’d rather hear (instead of reading) about the Passover meal histories and current traditions of a couple different families, I’ve just found an interview with Joan Nathan, author of Jewish Cooking in America and The Jewish Holiday Cookbook. Wow, what lovely and delicious looking cookies! It’s so cool to see inspired ideas for passover sweets — I’ll be making up a batch of dark chocolate covered matzot next week, and maybe these too! I can’t say enough thank yous for this… thank you, thank you, thank you… infinity! thank you SOOOOOO much for another passover dessert recipe! yours are always great (ie the butter/toffee matzo etc) and are a hit in my house during the holiday! keep them coming! I visit your site frequently (love the pix and recipes! ), but I’ve never commented before. As I sat down to eat yet another Almond Thumbprint Cookie from that original Gourmet recipe, and I began to read your blog, I felt compelled. I found this recipe as I was specifically looking for passover desserts (I make a flourless chocolate torte for the chocoholics). I made them on monday just to try them out. So much for weight watchers! Your version sound wonderful and now that I am going to have to bake another batch I just might give them a try. Hazelnut and chocolate, my favorites. Erin, #64: Try using sunflower seed kernals instead of nuts–they have a similar crunch and a nutty flavor. And are you allergic to peanuts also? Since they are actually a legume, not a nut, perhaps not. I love the little chocolate and jelly bellies. I love your pictures. Beautiful! why oh why must your post always make my mouth water. Gorgeous and must I say DELICIOUS! I love thumbprints. Combining them with my two favorite flavors – chocolate and hazelnut has made this dessert simply perfect for me!! Thank you! Will be stirring up a batch of these as soon as I get home from work. I have checked out all of your Passover recipes and was wondering if you have any other new ideas for this year’s Seder table. Hope you will share some additional Passover favorites. Have just come across your blog – its wonderful – recipes with humour and great photos – fantastic! Perfect for my nutella obsessed 10 year old! I just made these to take to an out of state seder that I’m leaving for this weekend. They were very easy to make and look great. I have high hopes that they’ll taste great too. Happy Passover. I am hosting a children’s seder and these are sure to be a big hit. This is my son, Asher’s, first passover, he is only 4 months old but I am excited to start some traditions with him!!! Although these took me over 20 minutes to bake per sheet (flour version, 12 per sheet, 2 sheets), they were absolutely delicious! I was going to do the cheesecake, but now these are on the agenda! I’m tempted to make indentations directly after the cookies are baked and fill them with a dark ganache, but I think I’ll stick to the originals first. *Droool* Cookies are becoming an obsession with me, thanks to you. Hazelnut & chocolate? Yum & YUM!! just made 3 varieties of these for passover — with chocolate, strawberry jam & marmalade — all delish! i found they needed a little more than 12 minutes in my oven, but they came out great. it’s so rare to find a yummy passover recipe; i am definitely passing this along to the fam! thank you! Ciao! I love these biscuits! I made them yesterday but I think I’ve completely got wrong with US measures… My biscotti didn’t maintain their shape and in the oven they spreaded at all and I turned out to have little and too chewie patties. I want to give this recipe another try, do you have any suggestion? Thank you! Oh my god, these look AMAZING! Ooooh. These are yummy! Perfect afternoon snacks (or midnight snacks) for everyone. And the fun part is…it could be any flavor. Made these yesterday for a pizza party we’re going to tomorrow. We used the flour version and El Rey baking discs, and they turned out perfectly. For those considering using Nutella–I really don’t think that’s necessary. The hazelnut flavor is already quite pronounced in the dough and all it needs is a good chocolate to top it off. Thanks so much for the recipe! Wouldn’t change a thing! I made these last night, so I have a couple notes: One, I could not find matzoh cake meal so just swirled regular matzoh meal around in the food processor so it was a little finer; that seemed to work just right. Two, the cookies took longer, maybe 15 minutes, in my oven. Three, the only chocolate discs I could find at my Whole Foods were these milk chocolate ones, which didn’t do so well in the oven (too delicate?). They kind of bubbled and dried out long before the cookies were done. For the second batch, I just baked the cookies plain, then pressed the disks on top right when the cookies came out of the oven, and that seemed to work just fine. Also, I’m at high altitude and didn’t make any adjustments. They look great! So excited to serve them. I made these over the weekend and I can now say I have a new favorite cookie. These were sooooo good!!! I couldn’t find chocolate baking discs at the store so I used chocolate chips… But for some reasno they didn’t melt in the oven so when they came out they were still in the form of chips. No worries, still tasted delish! I made these for last night’s seder, one girl took one bite and said oh wow these are actually good. They were a hit, tganks for sharing them,u saved me from boring macaroons. Oh my goodness, these look fantastic! I am Italian and everything chocolate is always infused with hazelnut where my family is from… so, yum! I can’t wait to make these for my family! I made the flour version the other day, and they were AMAZING!! I just love the hazelnut/chocolate combo. I did half the batch with dark chocolate bellies, and the other half I filled with nutella. Both tasted awesome, and I think I will do this (half and half) again next time. Thanks so much for the recipe! This recipe is a winner, deb. I made the flour version with dark choc buttons. My colleagues loved them. I made the almond version, and they are the best Passover cookies ever. My only changes in the future would be a touch less sugar and a touch more salt. Question, Deb: Why does the recipe specify baking these one sheet at a time? Two sheets in the oven at once doesn’t seem excessive, unless your oven is tiny. Anyway, thanks for yet another wonderful recipe. I made these the other day for Passover. They are great! I am also not a huge fan of the taste of Matzah meal, but you can’t taste it in these cookies…I made half with dark chocolate and half with milk chocolate, they both came out super tasty! Thanks for a GREAT kosher for Passover recipe!! I just made these with pecans, and they are great! Perfect to tide us over for the last few days of Pesach. WOW!! What a revelation!! I made the almond version, with both blackberry jam and nutella filling options and the buttery goodness just about bowled me over! LOVE IT! As an added bonus they came out great as gluten free, using whitewings GF plain flour instead of normal plain flour as a substitute – same volume and everything! :) Happy Days! I just pulled my first sheet out of the oven and was shocked at how much they spread!! (Nearly flat!) Is my oven too hot, not hot enough, or what could the problem be? I followed directions exactly. No biggie, but from the cookie recipe page, this like doesn’t work- typed “hhttp”. Wasn’t sure how else to let you know! caleal — Thank you! I had no idea. Now fixed. Ever since I was a little girl, my mother and I have made jam thumbprint cookies for Christmas. It’ll be great to add another variation next year. The cookies will surely be adored by my chocolate-fiend older brother and his 5 year-old daughter. A couple of additional notes…used the blender and it worked like a champ. Blended the heck out of matzoh meal to make the flour and it totally worked. Everyone who suggested using this as a nutella sandwich cookie is a freaking genius! I will post a recipe…homemade is so much better than the jarred stuff. For the jam version – do you put the jam before you put them in the oven or after? Hi Marina — Before. I adapted this recipe from this one, if you’d like to see other options. Thanks a lot :) I had some spare apples, so I made them as for the apple pie cookies (smaller discs, though) and I used them instead. It worked great! Like Heather I saw this recipe and thought “well if we’re doing chocolate and we’re doing hazelnuts I might as well brown the butter I have to melt.” I’m currently chilling the dough so I don’t know for sure but I’m hoping these taste like an easily portable version of hazelnut brown butter cake. My family always requests ‘Hazelberries’ for Christmas. I have found and lost the family recipe more times than I can count. This year, instead of asking my mother, yet again, for a copy, I made these. And they’re better! Mine had a tendency to go all pancake on me for no apparent reason. These are beautiful, and if memory serves, much easier. Thank you! Under the link for King Arthur you had specified Bittersweet Chocolate. Does it matter, taste wise, if bittersweet is used over semi-sweet? Not terribly. Use what you prefer. I accidentally found your blog and I’m grateful for that. Those hazelnut cookies look very tasteful. I’m gonna bake these for a high tea party that’s coming up next weekend. Thanks again! Just made this recipe and they are awesome! I was wondering if these could be stored in the fridge as I’m in FLorida and I’m worried the chocolate wont properly set due to the warm weather yet I made these for an event tomorrow. Thanks!!! I meant to ask, can you use caramel instead of chocolate/jam or would it get too runny? I was thinking of premade caramel sauce or pieces of toffee to fill the hole. I made half of these with chocolate discs and half with just a hazelnut. The ones without chocolate were even better actually. The chocolate sort of overwhelms and masks the hazelnut flavor I found. Delicious either way, but better as a pure nut cookie. How about filling them w Nutella???? Almost time for Passover baking this year and I have a lingering question that has kept me from making this recipe. If I substitute Trader Joe’s Just Almond Meal (finely ground almonds – that’s all) for the hazelnuts or any actual whole nuts, do I use 4 oz. by weight of the meal? or a scant cup by volume/dry measure? Thanks much! Big fan, but I rarely post. I’m seconding Paula’s question – I don’t have a food processor for Passover, but I do stock ground nuts. How much ground hazelnuts/almonds by weight? You’ll want to use the weight listed — 4 ounces. I tried making the almond version of these cookies and they came out all crumbly and fell apart. Any suggestions? These were the best Passover cookies I have ever made, though I too did have to bake them a bit longer (closer to 15 minutes), and given that I ended up with more than 24, it wasn’t because my cookies were larger than they ought to have been. As for grinding hazelnuts for Passover (see above comment) i bought a “manual food processor’ for under $20 for Passover use, and it does the trick perfectly. I made these last night for Passover with matzo meal not matzo cake meal and they came out flat and spread out. Any suggestions or could this have been because i did not use matzo cake meal? I do not have chocolate discs available where I’m from. Would it be ok if i made a tiny dent in the cookie dough and put a little cooking chocolate in the dent and baked it? Mia — Yes, I think that will be fine. Made these last week with matzo and they were amazing. My 3 year old son actually cried after eating three of them because he “needed to eat some more”, not “wanted”! He also helped me make them. Thank you. Hi Deb, it’s me again. I want to make these with some cocoa powder added (in place of maybe 3tbsp flour) and fill them with the dulce le leche you posted. But I think it’d be better to put it after baking. So do you think they’ll be ok if I make the holes before I bake the cookies and then fill them? And sprinkle them with some sea salt? And eat them all in one sitting? I’m not positive how well these will keep an indentation after baking without filling it before baking, but I suspect it will be fine. Still, the only way to find out for sure is to try it. Good luck! do you think coconut oil would work in these? need to make them parve and prefer not to use margarine. Any updates about trying these with coconut oil? Thank you so very much! OH MY. This reminds me of high school, when my friends would fight over the last Stella D’oro Swiss fudge cookies. I denied that they could be any good because they look like your typical 711 or federation-type cookies, but once I tried them, I was sold. There is something about that chewy-fudge center that if you could replicate, I would definitely be the first to follow! I like hazelnuts! But since I didn’t have any I used walnuts and added a couple tablespoons of brown sugar just in case it was too bitter. I made these cookies yesterday (with chocolate centres using the flour version of the recipe) and I could not believe how perfectly they turned out! Seriously, they look EXACTLY like the picture! I had made them for relatives visiting tomorrow, but they will all be gone by then :-) I followed the recipe precisely, but panicked when I thought the dough looked more like a batter, looking quite greasy and wet. I added maybe 2 tbsp extra flour and then stuck the whole bowl of dough into the freezer for 20 mins to firm up more than it would in my fridge. The finished cookies are unbelievably light, nubbly with hazelnuts and just the right sweetness. My family will make this recipe again and again and again now. Thank you Deb! Mine spread so aren’t very pretty. They taste great but why the spread? Yum! These will now be an annual holiday cookie. Thank you! Mine spread and completely flattened out even though I chilled the dough before baking. Any suggestions? Margaret — You can buy already-ground hazelnut or other nut meals at many stores. Bob’s Red Mill brand is fairly available and sells almond and hazelnut most frequently. I made these yesterday and they also took longer to bake…wow, are they good. Last week I made the oatmeal and white chocolate cookies…maybe our most favorite ever. I do have a question. You always say how long they’ll last, and much as I’d like to, I can’t eat them all in 2 days. Quality doesn’t seem to suffer after longer period except for the brownie cookies…they got dry. So why the short number of days? Btw, I’m anxiously awaiting your next book! I made the Passover version, and found them very dry & hard to shape. Should I add more butter? I, too, had to bake these about 20 minutes, even though I made them smaller than you did. I see the hazelnuts can be swapped for almonds. If I just wanted to make it easier on myself and use almond meal, how much would I need? 4 ounces? I’d like to make these tomorrow for a Passover dinner, with almonds instead of hazelnuts. Would you happen to know why 3/4 cup almonds should be used whereas the original recipe calls for one cup hazelnuts? Is there something about almonds that necessitates a scaling down of the nut to everything else ratio? Just made these.. The house smells delicious.. One question .. My chocolate discs have come out of the oven looking burnt and not shiny like yours. 10 mins in oven.. Should the discs still be shiny?